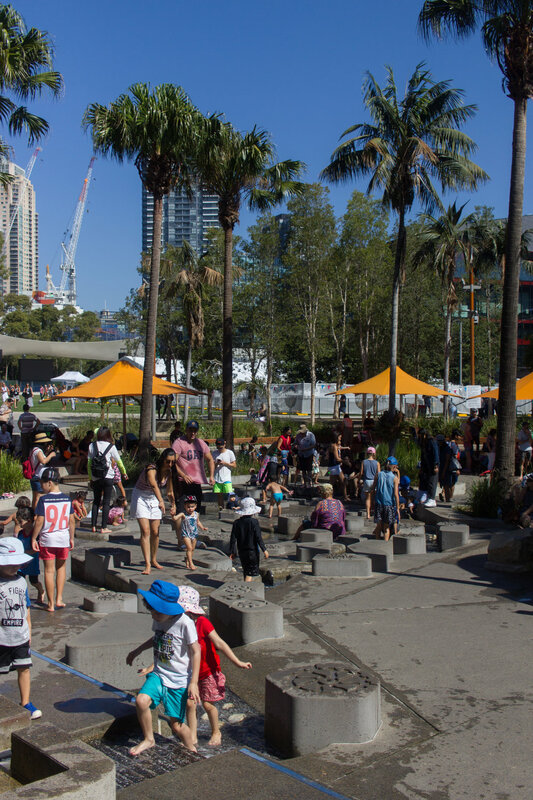 Sydney offers a spectacular variety of beautiful beaches and we are slowly hunting down the best toddler friendly options. Dee Why Beach ranks pretty high on our list. I'll admit, we've only just scratched the surface when it comes to Sydney's beaches, but, what I love about Dee Why is that it has a similar sort of vibe to Bondi, just on a smaller, less chaotic scale. It has a wide variety of restaurants, cafes and bars along The Strand, a grassy promenade, there are ocean pools and not one but two playgrounds within walking distance of the beach. We headed out there on a Sunday afternoon while Braino's parents were visiting, to give them a taste of Sydney's stunning coast. While Dee Why Beach is one of Sydney's most well known surf beaches, we still found it to be safe for a toddler to splash along the shore. Farley enjoyed jumping over the waves with Braino. (Just be sure to always swim between the flags!) Getting down onto the beach with a pram isn't impossible but it is a little difficult - you would have to carry it down a few steps. We had Braino's parents with us so they were happy to sit with Hallie in the pram at the top of the steps while Braino, Farley and myself had a splash on the beach. Hallie must have been very relaxed by the sea air; she slept the whole time!. There was a lot of seaweed on the beach the day we were there but I believe it's not a regular occurrence - it depends on which way the wind is blowing. 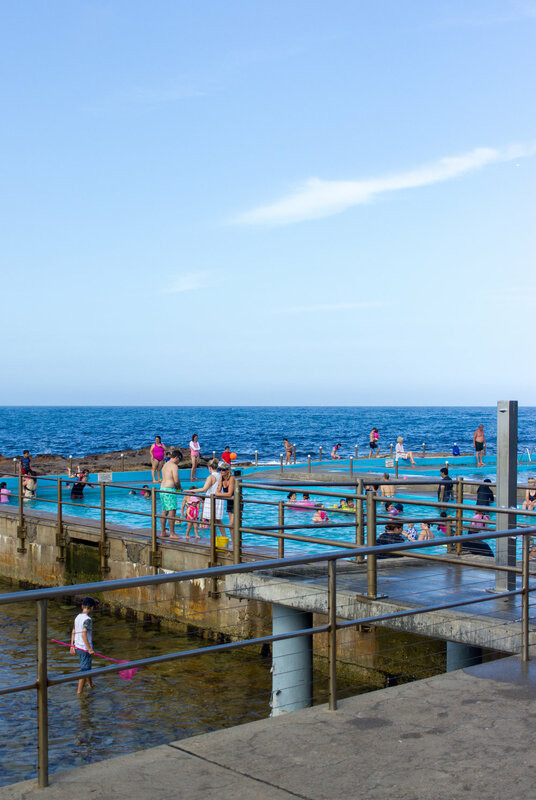 Dee Why also has great ocean pools, an adult one and a children's one, and some rock pools which always make for great toddler entertainment. While we didn't spend much time at that end of the beach during this visit, I would definitely come back just for the ocean pools! You can push a pram right up to them - there is plenty of paved pathways and plenty of places to sit at the pools. 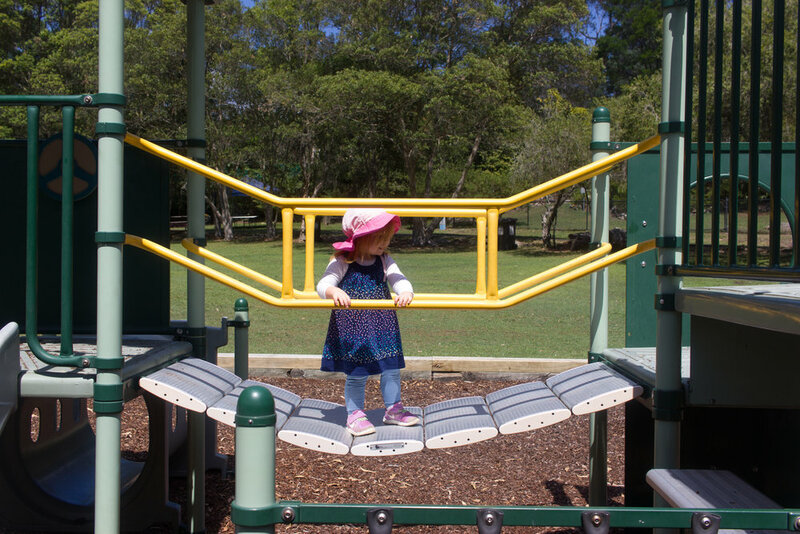 One of the best reasons why Dee Why is such a good option for families with toddlers is the choice of two fenced playgrounds within close proximity to the beach. 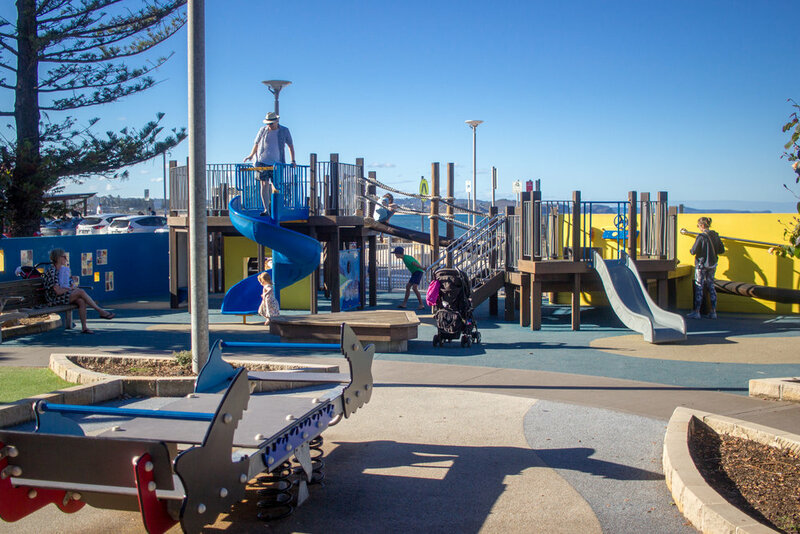 There is one right on the promenade, the Michaela Howie Playground, at the southern end, overlooking the beach and another one a very short stroll from the car park at the northern end of the beach, at James Meehan Reserve, near the surf lifesavers building. 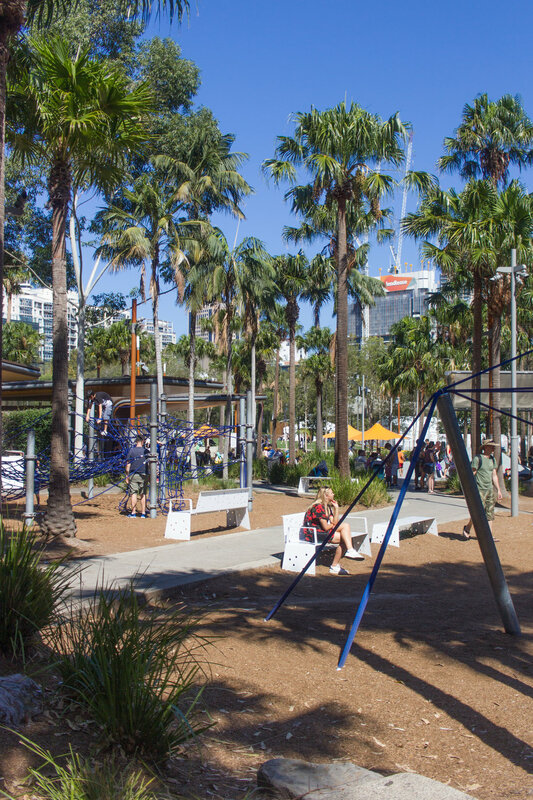 Between The Strand and the beach promenade is a well maintain sections of lawn, which is perfect for picnics or setting up a portable BBQ. You could easily spend a full day at Dee Why Beach and be kept busy with all the swimming options, dining options and playgrounds. Or just come out for a lazy afternoon and discover something new each time. Getting there: Unfortunately there isn't a lot of public transport options to the northern beaches. If you're traveling from the city the B1 bus or the L90 bus will take you to Dee Why town centre but from there, it's 15 minute walk to the beach. I would recommended driving. 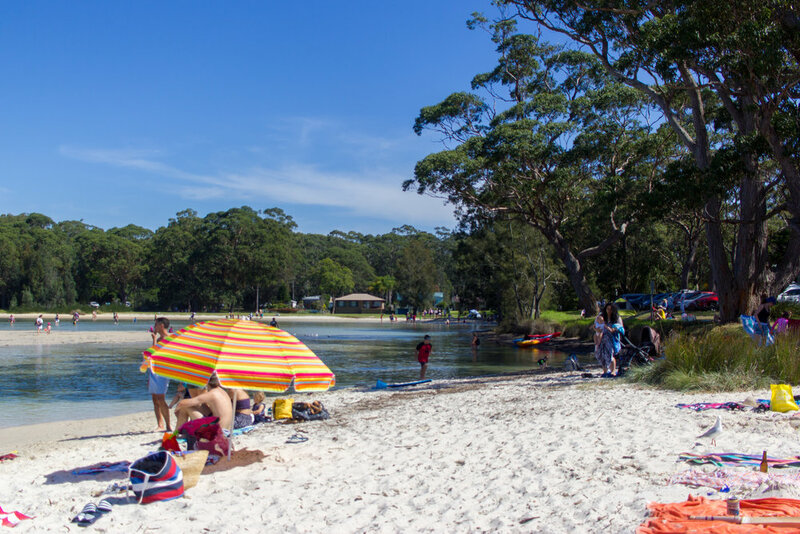 Parking: There is a large car park located at James Meehan Reserve, next to the Dee Why Surf Lifesavers, It's free for vehicles displaying a Council parking permit and pay and display is available for those without. There is also plenty of on street parking in surrounding streets, just be sure to check the parking restrictions. Dining Options: There is a huge variety of cafes and restaurants along The Strand and in surrounding streets. The first time we visited we ate at Beach Burrito which is walking distance from the beach. On our most recent visit, we had an early dinner at the Dee Why RSL, at Braino's dad's Rossco request. I would recommend both. We also purchased iceblocks and coffee from the Beach Shack, next to the Ocean Pools. Shade: Both playgrounds have shade clothes but the beach and ocean pool are in full sun. Definitely pack full sun protection for the family. Toilets: There are public toilets located at either end of the promenade, in the Surf Lifesavers building and also in the building next to the ocean pools. Not all outings with a toddler go completely smoothly; there have been been plenty of outings I haven’t blogged about - like the time I drove out to Bondi to see the Sculptures by the Sea festival but literally couldn’t find a carpark within a 2km radius so abandoned the mission and went to playground instead. Or the time we went to the Grounds of Alexandria, heavily pregnant, on the hottest, busiest day of the summer. And now with a newborn in the mix, it’s inevitable that things won’t always go to plan. Our outing to The Royal Botanic Gardens was one of these occasions, a lesson in juggling two babies. However I did love the Botanic Gardens and was amazed by the Pollination installlation at the Calyx. I managed to snap a few photos, so I thought I’d share some of our mis-adventure. Dad and Donna were visiting from Brisbane and Donna had mentioned she was interested in seeing the Rembrandt and the Dutch Golden Age Exhibit at the Art Gallery of NSW. I thought it would make for a wonderful multigenerational, educational experience; with any luck, we could let Farley do some exploring in the Royal Botanic Gardens and then she would nap in the pram, Hallie in the carrier, while I enjoyed some Art History. Ha! Very wishful thinking. Generally Farley is a real treat to take out and almost never has tantrums, however, in the middle of the herb gardens, right when Hallie woke up and wanted to be feed, Farley lost it - epic meltdown. After a few deep breaths and the realisation that an Art Gallery was no place for a disgruntled toddler, I sent Dad and Donna off to see the Dutch Masters. Once Hallie finished feeding and Farley calmed down and after a quick nappy change for both behind some bushes, I discovered we weren't too far from The Calyx which housed the Pollination installation. 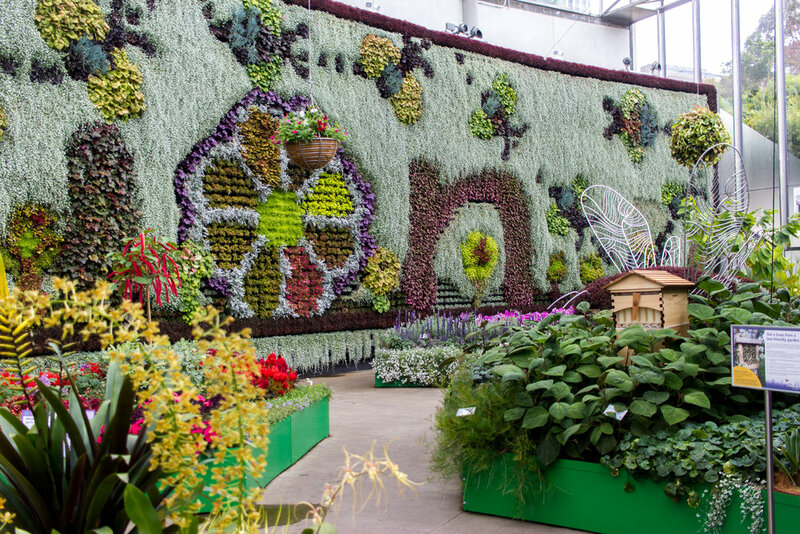 Pollination at The Calyx is an incredible floral display, celebrating how colour plays a vital role in the pollination process. It features an amazing 50 metre long wall which stands 6 metres high, covered in vibrant flowers and plants, arranged to spell Pollination. It’s quite an amazing site to behold and it’s also free! (although donations are appreciated) Farley enjoyed having a wander and exploring the plants, until she slipped over in a puddle, drenching her tutu and leggings in dirty puddle water! Arrhhh! (and of course I didn’t pack a change of clothes for her! I even contemplated it that morning when I packed a second outfit for Hallie but foolishly thought Farley wouldn't need it.) After some more deep breaths from me, we went off to meet Dad and Donna for lunch at the Botanic Gardens Cafe (which was really lovely!) I wish I could say Hallie slept the whole time, she slept all the way there on the train but after her feed in the gardens, she was having some trouble with trapped wind so she was grizzling on and off. A grumpy toddler and unsettled newborn is not a fun combination. After lunch we walked back to Circular Quay train station via the Sydney Opera House. Once back at Wynyard Station, the train we were waiting for spontaneously changed to an express train that would bypass our stop. (Transport NSW appeared to be having a very bad start to 2018) We figured it would be quicker to get on the express train and then back track to our stop. But then, with the already delayed train arriving in 2 minutes, I smelt the worse thing a parent could smell… a dirty nappy! Not wanting to miss the train (it was already dangerously close to peak hour) and not wanting to change a toddlers nappy on a train, poor Farley had to endure that situation for a bit longer. Then, the final another scene to our comedy of errors, once the train terminated at Hornsby, we got off and went up to the concourse to find out which platform we needed to go to to catch the train back to our stop. Only to discover we literally had to return to the train we had just got off! 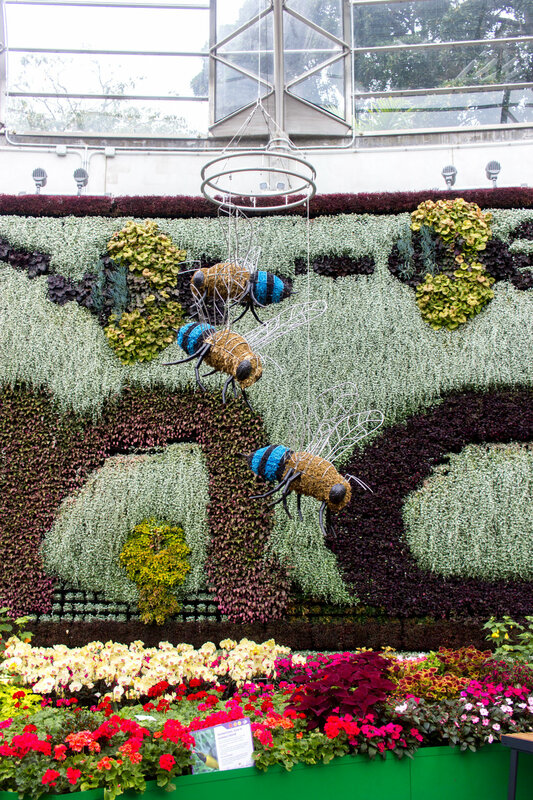 Pollination at The Calyx is on until 15th of August 2018. Getting there: The Royal Botanic Gardens are right in the heart of Sydney. We caught the train in and walked from Circular Quay, however there are parking options and many nearby bus stops. There is great information on the Royal Botanic Garden's website. Cost: Entry to the Royal Botanic Gardens is free! Entry to the Pollination display was also free however donations were appreciated. Pram Friendly? : Yes, there is plenty of paved pathways and lots of space! Sun Protection: There is a bit of shade throughout the gardens however, definitely pack hats, suncream and protective clothing and avoid a really hot sunny day with toddlers. We went on an overcast day around 30 degrees and it was pleasant. Dining: There is a number of cafes and restaurants within the gardens. We had lunch at the Botanic Gardens Restaurant and would recommend it. However, it's also the perfect spot to bring a picnic and enjoy sitting amongst nature. For a full list of dining options, head to this page of the website.